This page is devoted to providing details of what NAMA terms the “tranches” – the divisions of loans that NAMA determined itself to acquire. The first tranches were to absorb higher value loan exposures and later tranches the smaller exposures. You will find links to finer detail by Participating Institution (PI) at the bottom of this page. NAMA completed the transfer of Tranche 1 in May 2010 and Tranche 2 in August 2010. 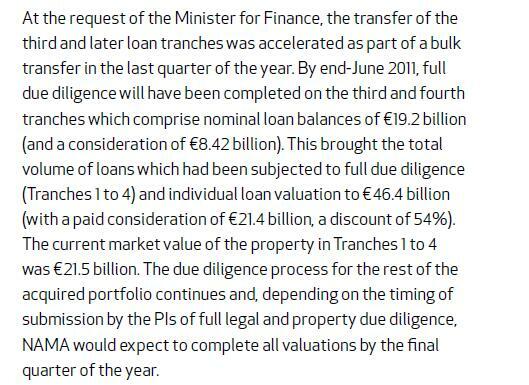 Tranche 3 was abandoned as NAMA decided to absorb all remaining loans in one tranche per PI. 28th July, 2011. The NAMA annual report contains some new information on the tranches. We had understood that after the first and second tranche transfers, that the tranche system was abandoned and there would simply be one further tranche (“a third tranche”) for each financial institution. It seems from the 2010 Annual Report published today that there are indeed further discrete tranches (3 and 4 are referred to). And the present position is this – tranches 3 and 4 total €19.2bn at nominal value (€8.42bn at consideration paid equating to a haircut of 54%) have been subjected to full valuation and due diligence and the remaining tranches will also have been subjected to full valuation and due diligence “by the final quarter of the year” Oddly enough there is no mention of EU approval of the valuation and due diligence of tranches 3 and 4. 20th December, 2010. AIB report that it has transferred €9.3bn of loans at par value at “an aggregate discount” of 59%. 1st October, 2010. It is unclear whether NAMA will complete Tranche 3 as originally intended (€12bn of loans split across the five NAMA Participating Institutions and due for completion yesterday). It seems that following Minister for Finance Brian Lenihan’s announcement yesterday morning, the tranche system is being modified with one remaining tranche per institution. The confusion is exacerbated by two reports in the Irish Times today – in the first the usually knowledgeable Simon Carswell says ” The third tranche of loans due to be transferred imminently was the trigger” whilst Una McCaffrey says “A further €2.3 billion in loans is due to move to Nama after the middle of this month”. That being so this page will be updated shortly to reflect the new arrangements. NAMA decided to acquire loans in segments or tranches. The first tranche was supposed to be in respect of the Top 10 developers for example. The second tranche supposedly covered the next c40 biggest-scale developers. The third tranche has been seemingly abandoned. From the end of September 2010 NAMA will transfer a further 5 tranches, one each for each Participating Institution (PI – AIB, Anglo, BoI, EBS and INBS). NAMA expects to complete the transfers of the five tranches by the end of 2010, and certainly no later than the EU-imposed deadline of February 2011. Here is the latest estimate of the totals to be transferred – these estimates exclude the reported €16bn of additional €0-20m loans from AIB and BoI that NAMA decided to absorb in November 2010 following the IMF’s intervention – there is no breakdown of the €16bn by bank. There is more detail of each of the tranches at the bottom of this page. Here is the spreadsheet of those developers whose loans are reported in the press (though not confirmed by NAMA) to be NAMA-bound together with Irish-based or associated developers whose loans may or may not be NAMA-bound. Updated regularly. What has happened is that NAMA is moving the last tranches across in “mini-tranches”. NAMA said last week that €53bn of the €73bn had been moved across and the T1 & T2 totals were only €27bn in total. It is pretty poor form that given the urgency with Anglo, which was supposed tyo be completed by 31 Oct 2010, that there has not been any official announcement but arguably events have rendered this accelerated transfer programme meaningless. RTE is reporting that AIB have transferred €9.3bn to NAMA at a discount of 59% meaning NAMA paid circa €3.8bn for the loans. It is unclear whether this includes or is in addition to the €3bn transferred in November. I shudder to think what the final discount on Anglo’s and INBS’s loans will be… 70%+? AIB say that the transfer is additional to the minitranche transferred in Nov 10. There is still another ~€7bn of AIB loans to transfer, sub €20m exposures and the betting is that they will attract deeper haircuts. By the way there must now be issues with AIB’s solvency. Will get a post out shortly. You see the table on page 38 of the Nyberg Report? First official consolidated breakdown I have seen of all the loans acquired so far. @Rob S, well spotted. There has not been any detailed update on tranches from NAMA since 23rd August 2010, so yes, that table is of interest and will be the subject of an update under “The Tranches” page. I am curious about the extent to which loans are legally transferred to NAMA. For properties here in the UK, we are finding that there is little or no evidence of a legal transfer, i.e. the loans legally remain with the relevant Irish bank (e.g. Anglo Irish) but behind the scenes NAMA is pulling the strings. This is relevant because if you are buying a property where the lender is, say, Anglo Irish, you have no way of knowing whether that property is affected. If you knew, you could advise your client that, as NAMA is on board, they should expect considerable delay in the property being cleared for sale. I would be really interested if anyone could shed some light on this? @Roy, “we are finding that there is little or no evidence of a legal transfer, ” do you mean that the Land Registry record still shows a charge in favour of the original bank and NAMA is not shown as a the beneficiary of the loan charge? Do you have any example which can be investigated? Sorry, namawinelake, I have only just noticed your reply. Yes, that is exactly what we are finding. The charge remains with the bank, and is shown as such at the Land Registry. There is no reference on the Land Registry title at all. Since sending my original message, I have found some information on the intranet that explains this. The FG/Lab govt seems to have come to the conclusion that formally transferring the assets is a waste of time and money as it would simply involve a transfer of the assets from one state owned institution (i.e. the banks) to another state owned institution (i.e NAMA). What appears to be happening is that the charge remains with the bank but NAMA pulls all the strings in the background. From the point of view of a buyer, this is not ideal. You just have to assume that if the lender is one of the five banks, there will be delay in obtaining NAMA’s consent. For what it’s worth, the NAMA chairman gave an interview on Saturday last – reported here https://namawinelake.wordpress.com/2011/06/25/nama-chairman-interview-on-rte-radio-%E2%80%93-agreement-on-just-one-developer-business-plan-%E2%80%9Cclose-to-finality%E2%80%9D/ – in which he invited people who had agreements to buy NAMA controlled property but who were experiencing delays to write directly and personally to him at NAMA. I don’t think that he wants to see a deluge of correspondence but if there are delays and you are a buyer, then presumably that might be a way to progress or expedite matters. Thank you very much, namawinelake. Hi can you tell me where i can get a copy of the Joint EC plan for restructuring and work out for ANGLO and INBS (it was due to be published Feb but i can’t locate it anywhere, there are references to it in Dail debates etc but its seems impossible to get a copy of it. any ideas? @maedb, from recollection the final Anglo/INBS plan was submitted to the EC at the end of Jan 2011. I am not aware of any approval, let alone publication of that plan. And I recall that the Bank of Ireland restructuring plan which was approved in July 2010 was only published with redactions in Feb 2011. Why do you say it was “due to be published Feb”? NWL : it’s great that you have created separate tabs on this site to identify tranches, developers etc.